We’d love your help. Let us know what’s wrong with this preview of The Cuban Chronicles by Wanda St. Hilaire. In the infancy of Cuba's tourism, Wanda St. Hilaire takes a trip to the tiny island. In spite of her love of all things Latin, she puts herself on a travel ban to Castro's Cuba, one that lasts twenty years. Underneath the fae of Cuba's tourism lies the desperation of a society living mostly in abject poverty. When tourists mingle with locals, we get a glimpse of what underlies the frivolity of Cuban entanglements. St. Hilaire speaks with an authentic voice and doesn't mince words; she recounts her own activities, emotions and opinions with refreshing honesty. To ask other readers questions about The Cuban Chronicles, please sign up. The very first thing that stood out to me is the format of this story. It is written in a diary/letter format very similar to Sands of Time. I found the style and structure to be something that brought me into the writers mind and moments. What this story really does well is set the scene and deliver the essence of who she is. Wanda sets out on a trip to Cuba and she invites the reader into her timeline with descriptive and eventful writing. Wanda's Cuban adventure is a great ride for those who h The very first thing that stood out to me is the format of this story. It is written in a diary/letter format very similar to Sands of Time. I found the style and structure to be something that brought me into the writers mind and moments. What this story really does well is set the scene and deliver the essence of who she is. 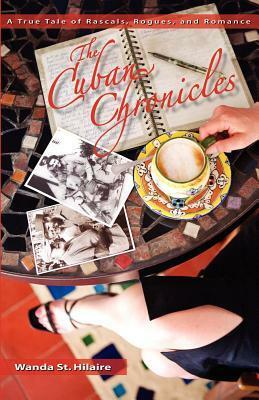 Wanda sets out on a trip to Cuba and she invites the reader into her timeline with descriptive and eventful writing. Wanda's Cuban adventure is a great ride for those who have never been to Cuba and even for those who know the country well. The honesty within the words of what it is to be a foreigner in Cuba shines through in her writing. The whirlwind of Wanda's romantic flirtations with many men finally ends up with her and Paulo together. But she doesn't live in Cuba... so the journey continues with a return to Cuba and the drama really heats up. reality romance + travelogue = gorgeous! I couldn't put the book down as the story kept me engaged to the end. The author beautifully blends cultural and culinary commentary into a "reality romance" story. Since I first read the book several years ago, Cuba has gone on to my must-see travel list. Looking forward to the author's new book for more of the delightful mix of travel, adventure and romance. An intensely articulate and moving travel memoir of self discovery. A fiercely honest account of what can happen when we open our hearts to new experiences and cultures, and the bravery to deal with the consequences and willingness to share with others. i loved this book! The authors honest, real stories of her exploits in Cuba were touching and interesting. She met some real rakes, thats for sure, but did encounter some nice people along the way as well. I highly recommend this for any woman, whether she be happily married or miserably single or vice versa. Something for everyone!! I really struggled with the way this book was written. I usually really enjoy first person narratives, but I found it really hard to get into this novel. Maybe I need a few more years under my belt before I can relate and engage with the main character. This book has author's autograph. Wanda St. Hilaire is a two-time breast cancer survivor with a predilection for research and a passion for delving into the psychology of wellness. After a second diagnosis in 2010, she made lifestyle changes that contributed to her healing and supported her philosophy that our lives are meant to be lived doing what we love in places that make our hearts sing. Through writing, St. Hilaire shares what Wanda St. Hilaire is a two-time breast cancer survivor with a predilection for research and a passion for delving into the psychology of wellness.